Lens selector for 8mm lenses of all models. Condition is good on all. One has price written in ink on cover. There is so much information in this collection, as well as graphics, and the small magazine has excellent pics of factory and products. This wrench is made from 3mm thickness brass. I will make a wrench of your order size. Hand made tool. (no exception). However, I could not get the lens to trip or the film to advance when tested. I think the 2 actions are related. Serial # D83441. A nice piece for anyone's collection. The wood and bellows are in excellent condition, like new. Included are two wooden plate holders with lids that slide up and fold over. Each holder may hold two plates. TWO PLATE HOLDERS. 2 accessory pockets under the lid, 2 movable partitions, and a divider/cover. Lined shoulder pad sling strap. "Italy" stamped under the closure. Looks to be in nice condition. 1 Tiffen 49mm UV Haze 1 Filter in plastic jewel case, and box. RARE Camera Beirax, Beier Dresden ca. 1936 with case. Avigon f1.9 1 1/2 8mm Cine Lens No. C11075 with original case. Honeywell Tilt-A-Mite with vinyl cover. Sears multiflector with vinyl case. Color may vary between individual computer monitors. No information available or if in working order. Over all good shape except for the crack on housing (see pic). The snap case is leather with an adjustable neck strap. Antique Wooden Victorian Stereo "Stereoptican" Viewer, c.1875. Made of nicely finished wood, possibly mahogany. It enables sliding the card holder back and forth to enable precise focus for each individual person's preference. The speeds seem accurate in all settings. There is no identifying information on the box as to its maker. The box appears to be made of solid maple with brass plated corner braces, hinges, and latches. It has a lock but no key. The keyed latch works as do the clasp latches on the front of the box. Fold-up viewfinder on top. Tested and shutter is working, though not tested with film. New/near-new condition. Vintage Hard Leather Black Case For Cameras ans Accessories..
Nikon tee touch macro 38/65mm auto flash good cond. The item is as captioned in the title line of the AD and as pictured. 'BILLY THE MARLIN' 35mm. FLORIDA MIAMI MARLINS . WOULD MAKE A VERY UNIQUE GIFT. NEW IN BOX--NEVER USED. ITEM REMOVED FROM BOX ONLY FOR PHOTOS. Up for sale is one pewter belt buckle modled after the classic 1970’s 35mm Canon AE-1. I have no other details available on this item. No date or manufacturers info is listed on the back of the buckle, only the lettering on the back of the buckle shown in the photos indicates anything regarding its origins. The buckle is in excellent condition. It seems to have never been used. All sales are final. No returns on this item. Please bid accordingly. $8.00 for shipping & handling to locations within the contiguous USA. THIS IS FOR A 14" WHEEL. The item is as captioned in the title line of the AD and as pictured. THIS HAS BEEN IN STORAGE. 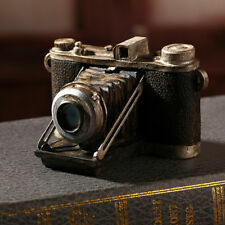 Great for lomo photography. NEVER USED. - Manual in every way: Film Advance is dialed by hand. Film Rewind is hand-wound with crank. - It has a Hot Shoe. Folding camera, 6x9cm. with a Zeiss Triotar 12cm F:6.3 for display or restore. There is no focusing back or glass. Lens and shutter are Zeiss. Bellows are in good shape. Handle strap is broken. Exterior covering is in good but worn condition. Here is a very nice vintage Nikon CH-5 hard case which was made to old the Nikon F2 cameras with a long lens attached. It is in very nice shape showing some wear from use. Buyer pays shipping. Has NOT been tested. View finder maybe a little dusty. I had an extra lens cap, so I added the Bell & Howell lens cap. Cap (Bell & Howell). Curacao Dutch Island. F-15 Fighter and Runway Photo. Argoflex With Leather Case Box Camera Vintage. Shipped with USPS Priority Mail. Stereo 3D Photo Composition. This looks amazing in the 3d viewer. Great Condition. The bottom tape is in good condition. The dark slides operate smoothly. All these holders have been tested for light leaks and all pass with flying colors! We are unsure of the working condition, so it is being sold 'AS-IS'. In this lot is a Kodak Instamatic 40, Kodak Instamatic X-15, Konica C35, JC Penny 11, Samsung Fino 105, and a Samsung 1050. Probably from the 1930's. If you do pinhole this is a step up. Vintage Hard Leather Case For Cameras and Accessories.